The Fringe, Edinburgh International Festival, Edinburgh International Book Festival, Edinburgh Art Festival… there’s no doubt that the Edinburgh population grows considerably every August. Visitors flock to our capital to soak up the atmosphere, the art, the architecture… but what about festival accommodation? 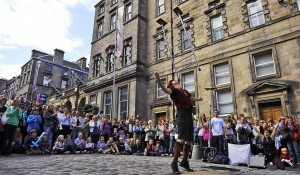 So when you’re visiting Edinburgh – where do you book festival accommodation? A hotel? There are certainly advantages. Like room service, a restaurant, maid service and dry-cleaning. But there are only so many rooms available in the city centre, and those rooms come with a serious August price uplift. The other option is serviced apartments. A bit more freedom, you’re not tied in to an expensive breakfast or paying for leisure facilities you don’t want to use. You get fresh linen and towels every day and a 24hr reception. Or… you could get the authentic Edinburgh experience and rent a property. You can do that by using a letting agency, or you can also use Airbnb. When you rent your own property, you have more space, you have the freedom to come and go as you please, you can eat what you want when you want and you can entertain guests. Have as many bedrooms as you need – the more you have the more economical it becomes. You can get a taste of what it’s like to live in the medieval Old Town, the Georgian New Town or something entirely more modern. Factotum has a lot of festival accommodation properties to choose from. Leaving all that aside – let’s get down to it. What is the difference in cost? We looked at the prices for festival accommodation in Edinburgh City Centre (quoted in March 2018) for 2 adults and 2 children for 2 weeks from 4th – 18th August 2018. None of the above include food. All have laundry services (although this is a paid extra in a hotel), WiFi and utilities are included. There’s no doubt that staying in a holiday apartment is cheaper than a hotel or self-catering apartments. At this point, it’s between using a letting agent or Airbnb. The great advantages of using a reputable letting agent is that you know exactly what you’re buying. Factotum ensures all properties meet appropriate regulations. They are cleaned by professionals before your arrival (at the Landlord’s cost) and there is a team of people there to talk to, in Edinburgh, whenever you need them. Lose your keys? We have spares at the office. Need to speak to someone? Give us a call or pop in. An Airbnb landlord is often letting out a single property. They do not have to adhere to regulations and they don’t have to be there to give you keys (which are commonly kept in lock boxes outside the property). Full cleaning costs (including linen) are also billed to the tenant. For a full list of Factotum’s Festival properties, click here. It’s not only the best way to see the city, it’s also a bargain!